The ruins of Ancient Corinth (centre) are surround by a modern community. This view is from the Acropolis Hill (Acrocorinth). “All things” covered in this chapter are to be DONE (not neglected) “decently and in order.” A former Archbishop of Canterbury said that we trip over the word “decently,” and he also said, “When the Spirit moves, things can become rather messy.” The Archbishop was a speaker at a conference on evangelism here in Canada. He was not discouraging us from exercising the gifts but pointing out that our spirits are in our control (14:32) and that “God is not the Author of confusion but of peace (14:33). Note that the words “edification, edifies, edified” appear over and over. The public exercise of the Spirit’s gifts is for others, and for the whole Church. Also note that, in the final result, speaking in tongues and interpretation in the church service should produce the same building up (edification) as prophecy. However, it is important for a person also to build up the Spirit’s life within. Note that praying in tongues in personal prayer, while not knowing the meaning of what one is saying, edifies one’s self. Obviously this is what Paul referred to when he wrote, “I thank my God I speak with tongues more than you all” (14:18). In the book of Acts, there are five occasions when believers are filled with the Holy Spirit. In four of those we know they spoke in tongues as an initial indication that they had experienced the Spirit in this way. In the first happening (Acts 2), people understood the tongues. In the others, it does not say they were understood. It would seem that they were “giving thanks well” (14:17) and were being personally edified by a private prayer language on those occasions. Lord Jesus, John the Baptist said that You would baptize me with the Holy Spirit (Matthew 3:11b). I’m fully open to You every day. Please immerse me in Your Spirit again today. I’m praying right now “with the Spirit” and “with the understanding.” Hallelujah!!! I need to be edified so that I may bless others, and I cannot do this unless I am blessed myself. I know that the Holy Spirit came to live in me when I went forward at a Youth for Christ rally in December, 1952, and He has constantly lived in me ever since. I am the temple of the Holy Spirit, as are all believers in Jesus. Then in June of 1953, I was first fully filled to overflowing with the Holy Spirit, immersed in Him, and I spoke in tongues. It was while I was in prayer, and there was no interpretation of what I said. It was several years later that in my personal devotions I found myself praying in tongues. I immediately read again 1 Corinthians 14. I knew I was edified and that I was in good company with Paul (14:18). In the church, along with Paul, I’ve spoken well over 10,000 words in the known tongue. I must not avoid verses 34 & 35 in our reading. My father, a preacher, missionary in Egypt, college professor, and my hero in ministry, told of a time in Timma, Egypt, when he was preaching. There was a wall between the womens’ section and the mens’ section of the church. This was a tradition based on the Temple in Jerusalem and on the synagogues. At one point in his sermon, a stressed-out mother (all of the children were on the womens’ side) yelled a question over the wall to her husband. He didn’t tell us what she asked, but I can use my imagination. My father quoted 1 Corinthians 14:35 and asked her to allow him to continue his sermon without interruption. She graciously complied. Some have taken this verse to forbid women in a preaching and teaching ministry. If that’s what Paul meant, then how does one explain the many women who did preach, teach, and prophesy with the blessing of the early Church? I like my Dad’s explanation of this Scripture! Here are the ruins of an ancient church that is on top of the Acropolis Hill (Acrocorinth). In the Archaeological Museum of Ancient Corinth many artifacts are on display. This is the Marble head of Dionysos, 2nd century A.D. The “MORE EXCELLENT WAY” is LOVE! From 13:1 to 14:1 “LOVE” is found 10 times. It is appropriate that both chapters, 12 & 13, are included in today’s reading, for they are usually read in exclusion, one from the other, and sadly also in opposition, one to the other. We should make sure that we do not stress the gifts of chapter 12 while failing to emphasize the love of chapter 13, or stressing the love of chapter 13 and ignoring the gifts of chapter 12. God has given the gifts of the Spirit to His people, and He expects them to be used to show love to one another. God’s love manifested through us is also only possible through the work of the Holy Spirit. A gift is not an indication of spiritual maturity, but love; a fruit of the Spirit (Galatians 5:22-23) is an indication of the growth in Christ of the believer. We give gifts to our children, not because of their conduct, but because we love them. If we based our gifts on good behaviour, our children would earn them and, therefore, they would not be gifts. The Corinthians did not exhibit the best behaviour, but God still gave them gifts. Let us “desire spiritual gifts” (14:1), and use these gifts in “A MORE EXCELLENT WAY,” exhibiting the LOVE described in chapter 13! Lord Jesus, I recognize that Your character is described in chapter 13. Live and love through me, Lord Jesus, I pray. Thank You for the gifts You give to build up Your Church, to exhort me to seek the good of others, and to comfort others. I gladly receive and desire to exercise all these gifts. In Your Name, Amen! Before I became an ordained minister, I taught public school. I was so impressed with 1 Corinthians 13 that I required my students to memorize all 13 verses. I had read that many scholars considered the King James translation of these words to be the most beautiful in the entire English language. Of course they were written originally in Greek and translated by those assigned the task by King James during the first years of the 1600’s. I see chapters 12 to 14 as a sandwich in which 13 is the meat and 12 & 14 are two slices of bread above and below the meat. To be well-nourished spiritually, we need to eat the whole sandwich. As a child during our meal, I remember leaving the table, riding my little scooter into the living room and depositing my crusts behind the couch. That practise ended abruptly when the remnants of the bread were discovered. I must confess that I went through a period in my Christian life when I did not want to partake of what may have seemed like the bread crusts of the gifts of the Spirit, particularly the speaking gifts of tongues and interpretation of tongues. One of my theological professors gave the interpretation to a message in tongues, and the thoughts that came immediately to me were the same as his words. After the church service concluded, the teacher, Rev. Gordon Atter, came to me and reprimanded me. He said, “David, God gave you that interpretation and you disobeyed God in not giving it. Because you failed, I had to give it for the proper exercise of this gift in a public meeting.” As far as I know, I’ve not made that mistake since. Statue of the god Serapis found in ancient Corinth. There were two precincts dedicated to this god on the Akrokorinth (the Acropolis) of the city. Serapis was worshiped throughout the Mediterranean basin; his worship seemed to transcend ethnic boundaries and earned him reverence in the Egyptian, Greek and Roman cultures. A Christian artifact from the Archaeological Museum of Ancient Corinth. Partaking of the emblems of the body and blood of Christ is not an option which we may or may not exercise. It’s an order! Paul says, “Do this!” (11:24b). Remembering Christ’s death and resurrection is of vital importance (11:25). Let’s look at the positive aspects of Paul’s teaching regarding “hair.” Women in the Corinthian Church were taking advantage of their new-found freedom in Christ and they were praying and prophesying in public gatherings. Good! But some appeared to be flaunting social convention by what would’ve been considered in the culture of that time and place as inappropriate and distracting. We are informed by cultural historians that at that time in Greece, only the prostitutes were seen in public with their hair uncovered. For Christian women to disregard this would have hurt their testimony. However, Paul was not making this an order as he did with remembering the Lord’s Supper. He assures those of us who live in other cultures and at other times that we are not bound to these social practices of Corinth. “Contentious” people will make a big issue of hair styles even today. “We have no such custom, nor do the churches of God” (11:16). Lord Jesus, I thank You for Your death and resurrection which I remember daily in my personal devotions, and also, without fail, together with my local congregation. Help me, I pray, that I will discern (understand fully) the depth of Your love and provision for me in Your Cross. I ask for health, physical strength, and length of days which come to me as a result. In Your strong Name I pray. Amen! A preacher titled his message, “Top Knot Come Down.” He wanted the women to take the bun in which their hair was gathered on top of their heads, which he saw as an evidence of worldly pride, and move the bun down to the back of their heads. His text was taken from Jesus’ words as recorded in Matthew 24:17, “Let him who is on the housetop not come down.” This story illustrates for me how unwise it is to take temporary cultural expressions and insist that they be followed always. I’ve asked my sons to find a photo of a very religious Jew in Jerusalem who rigidly follows a dress code which originated sometime in the middle ages in a remote village of Eastern Europe. I think about these things and want to make sure I don’t get caught in such a trap. Perpetuating traditional Jewish customs from Eastern Europe. Looking to the northeast you can see Lykavittos Hill and Athens’ urban sprawl viewed from the Acropolis in Athens. When Paul writes, “That Rock was Christ,” (10:4b) he may have been thinking of one of the great rocks in the area. …and all drank the same spiritual drink. For they drank of that spiritual Rock that followed them, and that Rock was Christ. Dear God, by Your grace given to me, enable me to live so passionately for You that my very life will be an example of Christ, so that my words, those things to which I give my time and my money, will be effective in seeing people saved. Amen! I remember my preacher Dad saying, “They wobble in and wobble out, and leave the people all in doubt.” I don’t remember the occasion. He may have been referring to a politician or perhaps a preacher who spoke moral concepts without the power and authority of God’s Word to prove that he spoke God’s true message. Preparing this blog each morning is leading me more deeply into the mind of God as He expresses His thoughts through the Prophets, the historical record, and in particular, the teachings of Jesus and the Apostles. Yours for living to the Glory of God! P.S. Have you ever sent my blog to a friend? I don’t know how to do this, but I’m told it’s done by a couple of clicks (my son says you can cut and paste the “100words.ca” web address from your web browser into an email or onto Facebook). The next generations make it look so easy, and I sometimes feel that I’m still in the horse and buggy era. Ha! But I’m enjoying life right where I am! Looking toward the south-west from the Acropolis in Athens, you can see the Odeon of Herodes Atticus amphitheater that was built on the south slope in 161 AD. In the distance you can also see the Philopappos Hill. Ruins of a main street in Ancient Corinth. …to the weak I became as weak, that I might win the weak. I have become all things to all men, that I might by all means save some. Paul’s commitment, his personal discipline, his work schedule, and the way he lived his life are all described in our key verse. The motivation, “that I might by all means save some,” is all consuming. Yes, he’s very human also. His statement about Cephas (Peter) bringing along his wife may have been evidence that for brief moments he felt sorry for himself (9:5). Nevertheless, Paul persevered with a godly stubbornness that refused to pander to his personal pleasures. The same could be said about his financial resources. He worked long hours making tents to support himself here in Corinth. He makes the point that he had every right to be supported by the offerings of the believers, but that for his own reasons, chose not to accept money from them for personal use. Just in case some would make a mandatory practice of this, remember that Jesus and the twelve accepted donations for their support (Luke 8:3). Joanna, the wife of Chuza, Herod’s steward, and many others provided for Jesus from their substance. Paul, himself, declared in 9:14 that those who preach the Gospel should live from the Gospel. However, Paul made a personal choice to support himself by his trade. I’m sure this added exclamation points (!!!) to his message and to the way these rough, tough people of Corinth opened their hearts to Paul’s preaching. Lord God, May I be given grace to “become all things to all men, that I might by all means save some.” I pray in the Name of the One who did this completely, the Lord Jesus Christ, Amen!!!! When Jesus left Nazareth, He may have set up a carpenter shop in Capernaum. From time to time, in order to care for my family, I’ve worked extra jobs to provide necessary funds. For some reason one of my efforts comes to mind. I hope I don’t offend anyone, but I would drive to one of the many lakes in the area of Northern Ontario, catch bull frogs, and ship them overnight by train to a Montreal restaurant for their menu of frog’s legs the next day! There are several other initiatives I took in order to have the funds to stay in ministry, preaching the Gospel. In this blog, I’m like a child colouring in the pictures of a colouring book. My sons, Reynold and Ron, both ordained ministers, create the framework and outlines in which I “colour.” Reynold is a missionary in Africa with World Embrace, as well as a professional photographer. He spent three months in Israel, Jordan, Turkey, Greece, and Italy to shoot the photos for this blog. Ron is President of Heart to Heart Marriage & Family Ministries. The Bible is opened to 1st Corinthians in front of the Temple of Apollo in ancient Corinth. 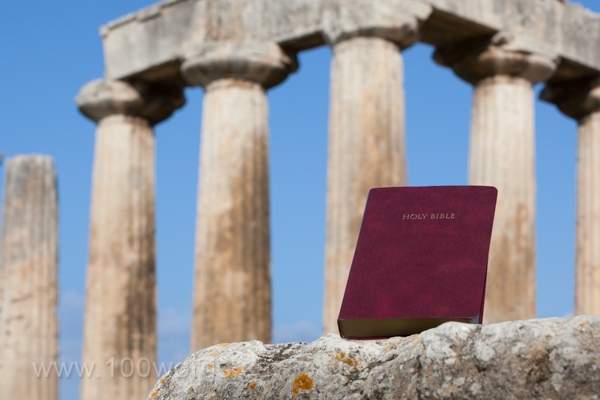 The Bible is featured in front of the Temple of Apollo in ancient Corinth. My son put it there. I think he had the right idea. The ancient temples are in ruins, but as Jesus said, “Heaven and earth shall pass away, but My Words will by no means pass away” Matthew 24:35. The first verse of today’s reading tells us that 1st Corinthians is the answer to a letter from believers in the church there. Paul is responding, not dogmatically, not claiming every word is from God, but as a caring counselor. We may want to reread verses 6,12, 25, and 40. Notice statements such as, “I say this as a concession,” and, “But to the rest I, not the Lord say:” “Now concerning virgins: I have no commandment from the Lord.” “I think I also have the Spirit of God.” This letter is “The Word of God,” not in the sense that God spoke directly here, but in the sense that it is an accurate record of Paul’s best advice as the one who had led many of these very people to Christ in the first place. In the city of Corinth there were approximately 800,000 precious souls. Many of them may have messed up in their marriages. Those tabloids with horror stories of messed up marriages found at the checkout counter would’ve had big sales there. To all, Jesus says, “Come to Me” (Matthew 11:25-30). Dear Jesus, I come to You, as the old invitation song says, “Without one plea but that Thy blood was shed for me, and that Thou bidst me come to Thee. O Lamb of God, I come.” I’d love to hear those words sung again (click here). Help me to pay attention to Paul’s advice, even if he does not claim it’s directly from You. Help me to listen carefully to my Pastor also. In the Name of Jesus, I pray. Amen! I must not make the mistake of thinking all Paul writes is in the personal thoughts category. Almost all he writes is distilled from the Word of God Himself in the book that Paul knows so well, the scrolls of his Hebrew Bible. Paul was educated in the most prestigious rabbinical school of his time. He writes 99.9% of the time with the full apostolic authority of God, Himself. No doubt he had memorized huge portions of God’s Word. Paul’s main teacher was Gamaliel, grandson of Hillel. Hillel is, to this day, perhaps the most respected teacher in all of Judaism. Some may remember that after I stepped aside as leader of the Crossroads ministry, I was given the title by the Board, “Minister of Social Concerns.” Paul was obviously carrying the “Social Concerns” portfolio here in chapter seven. In this role, I’ve participated in debates, appeared before government committees, etc. I’ve also sought to encourage the strengthening of Canada’s social safety net. I’ve tried to stay above politics and concentrate on the moral principles that should guide us to a better, more caring society. I’ve tried to avoid stepping into the quicksand of situational ethics, keeping my feet firmly planted on what the former British P.M. Gladstone (who negotiated with Canadians on our non-violent separation from Great Britain) called, “The impregnable Rock of Holy Scripture.” In fact, Gladstone sponsored three tours of his country by the American Evangelist D.L.Moody. Ruins and pieces of pillars can be seen at the Temple of Apollo in old Corinth. Corinth was an important city in ancient Greece and it played a major role in the missionary work of the Apostle Paul. Seen behind the Temple of Apollo is the steep mountain of the Acrocorinth. On top is the fortified citadel of ancient and medieval Corinth (see David Reynold’s picture below). It is the most important fortification work in the area from antiquity until the Greek War of Independence in 1821. The mountain is 575 metres high and its walls are almost 2,000 metres in length. At the highest summit was the Temple of Aphrodite, where prostitution was a prominent part of the worship of the goddess. The Amish call the practice of separating a person from the congregation, “shunning.” Paul, in 5:11-13, gives a list of those who are to be set aside from participating in the congregation. There is another list in 6:8-10. The leaders of the church in Corinth had written to Paul, who had founded their church, to ask him for his guidance in handling these most difficult matters (7:1). Why would Paul be so strict? The answer is found in 5:6-8. If we can find the time, we might do well to reread the words in the references listed here. Leaven, or yeast, will cause the bread to rise well above the pan, unless checked by the heat of baking. Unchecked, it can make quite a mess. Sin, unless checked, will eventually infect the whole loaf, the church, the family, the individual life, and even the life of our country. The role of government is to stop evil from spreading out of control. More about that tomorrow. We might want to pray for a turn-around in the health of huge numbers of people infected by sexually transmitted diseases (STDs). Sexual promiscuity is the root cause of this modern epidemic. May God help us to be faithful to one man, one woman marriage, or else remain chaste as a single person. Lord Jesus, I’m well aware that sin is not just those actions mentioned in Paul’s lists. I often think of Your Word that says, “To know to do good and to not do it, to him it is sin” (James 4:17). Anything less than Your perfect plan for the human family is sin. Therefore, I have no problem agreeing with the Apostle John in 1 John 1:8-9. Thus, I ask for Your constant forgiveness and Your cleansing action in my life. In Your Holy Name I pray. Amen! When I was a very young minister, my hero in the ministry, Tom Johnstone, shocked me with this story. He was a Pastor in Montreal when he discovered one of the prominent men in his church was unfaithful to his wife. Here’s what happened! Pastor Johnstone, a one-time boxer, took this man by the lapels of his suit coat and said, “With the spiritual authority God has given me as your Pastor, I now deliver you unto Satan for the destruction of your flesh, so that your spirit may be saved in the day of the Lord Jesus” (5:5). The man fell to his knees, repented before God and his Pastor, and later to his wife, and the woman with whom he had committed this sin. God forgave him and so did his wife. That family was restored. His flesh was destroyed in that he, by his godly sorrow, identified with Christ in death. In Galatians 2:20 Paul writes, “I am crucified with Christ.” In Romans 6:11, Paul writes, “Reckon yourselves to be dead indeed to sin, but alive to God in Christ Jesus our Lord.” I’ve never been brave enough to do what Tom Johnstone did, but I’ve seen the same results in a number of wayward men. I’ve knelt beside them and prayed fervently for the gift of repentance, and for the power of God to deliver them from evil. I know God answers prayer. AMEN!!!!! A view from the entrance to the top of the Acropolis Hill (Acrocorinth). The Corinth Canal connects the Gulf of Corinth with the Saronic Gulf in the Aegean Sea. It cuts through the narrow Isthmus of Corinth and separates the Peloponnesian peninsula from the Greek mainland, thus effectively making the former an island. The builders dug the canal through the Isthmus at sea level; no locks are employed. It is 6.4 kilometres (4 miles) in length and only 21.3 metres (70 feet) wide at its base, making it impassable for most modern ships. It now has little economic importance. The canal was envisioned in classical times and an initial effort was made to build it in the 1st century AD, but the project was aborted. Construction finally got underway in 1881 and was completed in 1893. “Behaving like mere men?” Jesus said to Peter, “You are not mindful of the things of God, but the things of men” (Matthew 16:23). A paraphrase of that is, “You think like men think and not as God thinks.” God’s Word is the expression of His thoughts. In order to think and behave as God would think and act, it is of ultimate importance to stay consistent in reading and meditating on God’s Word. God has called and equipped pastor/teacher servants and put them in the pulpits of our local churches. We need this ministry gift. God put these people in our home congregations. Some of us unwisely run after big name ministers, or even think we can grow in our Christian life without the local church. If we think that, we’re wrong, and we, our families and friends will suffer negative consequences. As I think on today’s reading, it occurs to me that indeed, “The pen is mightier than the sword.” Paul’s pen penetrates deeply into our innermost beings. The church of Corinth provides an understanding into what eventually became our many denominational divisions. Paul’s has cut away (ouch!) at our careless attitudes toward those things that are harmful to the temple (our bodies) in which we live… overeating, smoking, etc, etc, and laziness or failure to work. All things which harm us are dealt with. It may be repentance time right now! Lord God, I repent of my laziness. Recently, I’ve twice slept beyond my early morning prayer time. Please help me as I grow older, and have certain physical challenges, to remain faithful to the disciplines to which You’ve called me. I can’t do this on my own. I need Your supernatural strength 24/7. I believe with all my heart, mind and soul that You will impart Your grace to me at all times. Amen! Several years ago, one of my fellow ministers introduced me to a book by Campbell McAlpine called, Alone with God. The author points out that our spiritual maturity is determined by the answer to this question, “How well do I know God?” He goes on to ask, “Do you believe your spiritual growth is commensurate with the time you’ve known God? Have you neglected the means of growth? What adjustments do you believe are necessary in your life to correct this?” I received a call from a person who is reading through the Bible with the 100words reading pattern. She said that she had read through the entire Bible once before, but could not remember reading of the horrible crimes recorded in the last chapters of Judges. My response was that in an attempt to read quickly, our eyes often glaze over and our minds go into neutral. Thus the extreme importance of a well-ordered reading schedule. The two-year program will make sure that we don’t miss anything and that our minds will stay sharp each reading time. A ship travels through the Corinth Canal. Here is the view of Athens from the Acropolis down towards the ruins of the Temple of Olympian Zeus. And I, brethren, when I came to you, did not come with excellence of speech or of wisdom declaring to you the testimony of God…And my speech and my preaching were not with persuasive words of human wisdom, but in demonstration of the Spirit and of power. Athens, where Paul preached his famous sermon on Mars Hill, was very different from Corinth. In Athens, he did use “excellence of speech” as he debated the philosophers (Acts 17:16-34). In today’s reading Paul has moved about 40 miles south to the largest city of Greece, Corinth. Athens was the intellectual centre. Corinth was the commercial centre. Because of its location on a very narrow strip of land between the Adriatic and Aegean Seas, almost all shipping to the eastern regions of the Roman Empire passed through Corinth in order to avoid the dangerous trip around the southern peninsula. A canal was dug in 1893 for the ships, but back in the first century A.D. it took at least a week to haul the ships on rails or great wagons up and over to the opposite Sea. Meanwhile thousands of sailors, government officials, military personnel, businessmen, etc. would have a week of leisure. Paul, who financed his mission here by making tents, would’ve had no trouble selling everything he made to accommodate the travelers. It has been estimated that there were at least 5,000 prostitutes in Corinth. I wrote the above in order to set the stage for Paul’s ministry, which will unfold for us as we continue over the next few days to read and consider these two letters from Paul to Corinth. The intellectual discourse of Athens would not get a hearing there. Demonstration of the Spirit and of power was absolutely essential in order to get anyone’s attention for the preaching of the Gospel. I’m way over 100 words….sorry. Lord Jesus, just as Paul had to understand the cities in which he communicated Your message, help me to understand the people and places where I live and witness for You. Please show me when and how to make Your case for believing in You. In Your Name I pray. Amen! Back in the 60’s and 70’s I read the Bible from cover to cover once a year, three chapters a day and five on Sunday. I encouraged others to do the same. Our ministry published study guides which were ordered by readers in advance. I discovered that by the time we reached Joshua, almost 80% of those who started with me had dropped out. In the 80’s and 90’s I moved our readings to two years through the Bible, moving from the Hebrew Scripture to the Greek, with alternate books for variety and balance between the Old and New Testaments. Approximately 80% of those who started with me in the new reading program ordered the materials and completed the entire Bible. These publications are out of print now, so I’ve moved into the brave new world of cyberspace just for you!!! These are the ruins of the Temple of Olympian Zeus in Athens. The Temple construction began in the 6th century BC. The Mount of Temptation above Jericho is said to be the hill in the Judean Desert where Jesus was tempted by the devil. The devil, who had been banished to earth, like Napoleon was banished to St. Helena years ago by the European powers, had direct access to Jesus to tempt Him to act contrary to His Father’s will. How much more would the enemy of all that is good, kind, loving, and true, tempt and attack the people described in the book of Judges. “O Lord, the God of Israel,” they cried, “why has this happened to Israel”…And the people grieved for Benjamin, because the Lord had made a void in the tribes of Israel. It is gratifying to find that, after the violent war between the tribes, there came a return of tender feelings, efforts at reconciliation and peace. It must have felt like gentle rain after the hurricane of war. Human tears, as they well forth on behalf of others, reveal the existence of the love of God expressed in acts of compassion. There is an old saying that, “Those who act in haste repent at leisure.” In other words, the process of godly sorrow for sin and for the foolish decisions, which sin produces, often takes years to heal. Israel is a case in point. Following our next readings in 1st and 2nd Corinthians (which start tomorrow), the blog will return to the book of Ruth. Here we will find the most tender feelings, even involving people from Moab, former enemies of Israel. After Ruth, the blog moves into the years of the Prophet Samuel. He is one truly bright star of righteousness who shines for God in his leadership. Lord God, as we are soon to discover in 1 Corinthians, some people are still in a moral mess, even after they have believed in Jesus as their Saviour and been baptised as Christians. Help me to learn and communicate the difference You have made in their lives compared to the people we’ve read about in Judges. Teach me, I pray, right from wrong, and teach me how to keep filled with Your Word and Your Holy Spirit, so everything will be better. In Jesus’ Name! Amen! God always answers prayer!! However, I heard a guest on the 100 Huntley Street telecast say, ” God’s answer may be as follows: NO, GROW, SLOW, and GO!” If it is “No,” that’s God’s absolute right to have other plans and to carry out those plans. If His answer is “Grow,” it means that I must grow in my Christian life before he says, “YES.” If He says, “Slow,” then circumstances must change in order to accommodate His full plan. If He says, “Go,” it’s obvious. I believe that true faith does not try to manipulate God into a “Yes;” it is simply a matter of obedience. Having prayed according to the Scriptures, I now live in God’s will and fully expect to continue living in His perfect will. Whatever happens is OK, because I’m not living according to my own understanding. I’m acknowledging Him in all my ways, and therefore His promise is activated. He directs my paths (Proverbs 3:5-6). The Monastery of the Temptation is an Orthodox Christian monastery located in the West Bank, along a cliff overlooking the city of Jericho and the Jordan Valley. It is built upon the summit of the Mount of Temptation, rising 350 metres above sea level. It currently serves as a tourist attraction and its land is under the full jurisdiction of the Palestinian Authority, but the monastery is owned and managed by the Greek Orthodox Church of Jerusalem.